Many moons ago my friend Camilla and I went into business with a friend of hers. We worked to our strengths and started a catering company. I worked full time and so could not be involved in the day-to-day running of the business but as Cams was stay-at-home mom, this role suited her perfectly. Kay is a chef and so menu creation was up to her. As I have a keen sense of business, those logistics were left to me. One Friday evening we were catering a dinner at a school for the teachers. Camilla’s husband at the time was a butcher and so he was hired to do meat on a spit. Camilla and Karen had to make sure there were enough salads and sides and I was joining them in the evening to be on hand for what ever was needed. Somewhere along the line, the numbers got mixed up and about an hour before we were due to serve I was making salad at home, in my very tiny kitchen. Basmati rice salad was on the menu and using a slightly different recipe to the one I have given you here, I made bowls of the salad in no time at all. This year Dave had a few friends over for a braai to celebrate his birthday. As it was four days after we had got back from overseas I knew I did not want to make too many complicated dishes. We decided on salads, bread and crayfish. I made this version of the basmati rice salad, using dried apricots instead of apricot jam as per the original recipe. There was no sugar free apricot jam at our local store, and I am really grateful for that. This basmati rice salad was by far better than what I had made so many years ago. What a brave thing you did, jumping to do a business with your friends. And what a great recipe! I love rice salad and I’m imagining how this would taste… hmm slightly sweet, spicy and creamy. Would love to read more about your catering business and would definitely try this recipe with egg-free mayonnaise, which I’m sure will taste as good. YUM!! I love basmati rice!! This looks great! Perf recipe for 2015! Happy New year! Basmati rice salad, I’m so intrigued by this! Looks interesting and tasty, Tandy!! 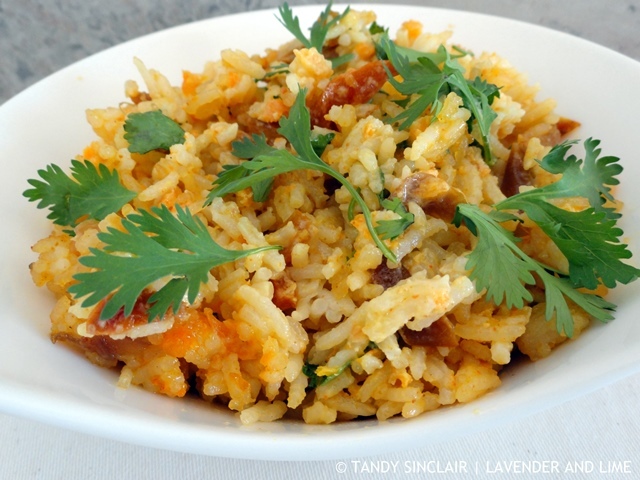 Hi Tandy, what a delicious rice salad, love the combination of ingredients used here. Your salad looks terrific. Happy New Year! Thanks Beth, and happy 2015 to you!